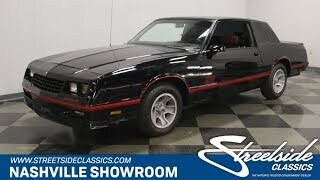 Hi, I am interested in your 1988 Chevrolet Monte Carlo SS (stock #1267-NSH) listed on Autotrader for $19,995. I'd like to get more information about this vehicle and confirm its availability. This car is interesting and significant for multiple reasons. For one thing, they were the last of the body on frame, rear drive, V8 Monte Carlos. Interestingly, every one of the 88s was completed in 87 before the turn of the new year. But most significantly, this is the car that helped make Dale Earnhardt a legend. The entirely Black, GM Goodwrench sponsored Monte Carlo sealed his place in history as The Intimidator . GM knew that this car marked the end of an era. Times were changing and so they created this very special Monte Carlo SS in order to end things on a high note. The car looks great all in Black, and this one is sporting a first class respray. The front of the car slopes down and reaches for the ground because it was needed to improve the aerodynamics for the race team. The blacked-out grill is flanked by quad rectangular headlights that are set deep back under the leading edge of the car. Red pinstriping runs completely around the car at its beltline flowing up and over the wheel wells both front and rear. SS Monte Carlo appears in red on the doors as well as on the back of the car. The windshield rakes back steeply and the notchback rear window transitions to a flat trunk lid with a lip spoiler on the trailing edge. Open the door and you will find a Ruby Red interior that definitely has nothing to do with a race car. It is plush and comfortable! The door panel is trimmed in soft red cloth with a long comfortable armrest and convenient door pull. Power window and lock switches are at your fingertips. The seats are covered in pleated Red cloth with smooth cloth side bolsters and red vinyl trimming out the sides and back. The two-spoke leather wrapped steering wheel is mounted on a tilt column and has an SS center button. Behind it is a stock dash with the speedo on the left, tach on the right, and the engine gauges in between them. The center of the dash contains the ventilation controls including those for air conditioning and a Pioneer head unit is mounted just below them. The center console holds a T-handle shifter for the automatic transmission as well as a nice storage compartment that doubles as an armrest. Open the hood and you will find a completely stock 305 cubic inch motor that is incredibly neat and clean nestled down in the engine bay. A flat black air filter housing feeds clean air to a Rochester 4-barrel carburetor and intake. Finned valve covers top stock heads and the exhaust is sent downstream to dual Flowmaster mufflers. Signs of good regular maintenance include newer belts and hoses as well as a new battery and new air conditioning lines. Power is sent back through a 3-speed automatic trans to the rear axle mounted on leaf springs and located by trailing arms. Up front, a control arm suspension and beefy sway bar with fresh bushings is balanced by a rear sway bar and helps the car handle well, while power front disc brakes provide good stopping ability. The rubber meets the road through 215/65R15 tires mounted on polished and painted honeycomb wheels. Want to stand out at the next car show? This black SS Monte Carlo will certainly turn some heads. Call today!